Landscaping is an essential part of maintaining and beautifying your lawn, garden, trees, flower beds, backyard and garden. There are a multitude of tool and equipment options for every application. Choose from the equipment and tools listed below for trimming, cutting, edging, weeding, digging, pruning, seeding, chipping or raking. Remember, if you plan on using it only once or twice per season, as in the case of an overseeder or aerator, you can always rent landscaping equipment for a fraction what it would cost you to own it. Aerators - Get your lawn aerator rental from Durante Rentals and help your lawn stay healthy and green. Just like all living things, your lawn needs to breathe in order to grow and prosper. The build up of lawn thatch makes it difficult for your lawn to receive the oxygen and nutrients it needs. Lawn aerators help reduce lawn thatch by poking holes into or pulling "cores" out of the soil to allow air, water and fertilizer to permeate the root zone. leaf blowers are perfect for blowing leaves, grass clippings and dirt fromyour job-sites, patios, decks, driveways, sidewalks and gutters. for felling, limbing and pruning trees as well as for harvesting firewood. We also sell chainsaw accessories such as new cutting chains,bars, cases and chain lube/oil to keep your chainsaw in good working order. material like grass,leaves and roots . The best time to use a dethatcher is early spring and fall. the overseeder cut through thatch growth and opens "slits" that are then filled by the new seeds. Best times to overseed are late summer or early fall. as well as quiet and easy to use. Tillers - Also, referred to as cultivators, gas powered tillers use metal blades to dig into the ground to perform various garden maintenance suchas soil preparation, weeding and composting. Our commercial grade tillers are perfect for working existing raised garden or vegetable beds or creating new ones. We carry both 16" and 9" tillers, both able to penetrate hard packed soil, hard clay or sod at a maximum depth of 10". lawn mower then using a turf rake for dethatching your lawn should be a breeze. You can usea normal rake but a gas powered turf rake will get the job done faster, easier and more efficiently. Our turf rakes for rent are portable with folding handles for easy transport. Our 20" wide standard power rakes also come with optional seed and grass collection attachments. and are perfect for construction companies and landscape contractors looking to clear areas of small to medium diameter wood and brush. Every job has specific “tools of the trade” that workers rely on to get the job done right. What do you think would happen if a mechanic was given a new tool that was totally opposite from what they were used to using? I think we’d all agree that their production would take a hit as there would be a new learning curve to hurdle. Or how about if you were vacationing in a country where they drove on the opposite side of the street and you needed to rent a car. You’d notice that the steering wheel was on the opposite side that you’re accustomed to. Yes, you would still be able to navigate the streets, but how efficiently and safely? Your brain would need extra time to process the simplest of tasks, like how to make a left or right turn, when it used to be a move that was second nature and required little or no thought. Many heavy machine operators, or general contractors, who regularly rent machines like excavators and backhoes, run into similar problems. They’re working with a backhoe where they’re accustomed to the controls and now tomorrow’s job requires the use of an excavator where the controls are totally different. As with the car example, they’d still be able to operate the machine but at what speed, level of expertise and safety standard? IHI excavators offer a simple solution to this issue. Their quick changing operating pattern selector (A to F Quick change valve) allows instant changing from backhoe-style to excavator-style controls and vice versa with the flip of a switch. Yes, it’s that simple and fast. For optimum performance, it’s essential to provide operators with the control pattern, digging position and control feel they prefer. They become more efficient and productive when presented with the option of selecting a familiar operating pattern, eliminating potential problems and delays. Equipment rental companies benefit by keeping there customers happy and potentially eliminating added stress to their machine fleet. Remember, a comfortable operator is a more productive operator, especially when working in tough conditions and on jobs like trench digging. Just flip the switch and you’ll immediately save time and money while decreasing potential job-site hazards and accidents. 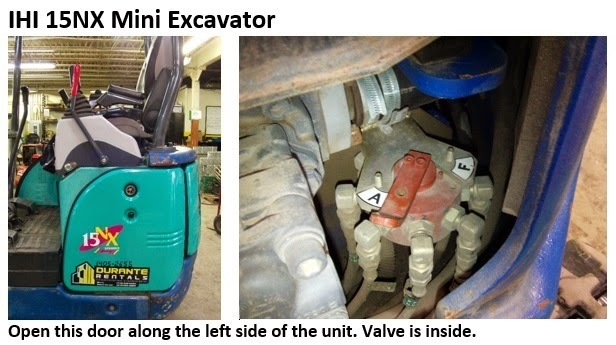 Please see the photos below for help locating the on your specific IHI excavator.